(Washington, DC) – Judicial Watch announced today that it obtained 183 pages of documents from the Department of Homeland Security revealing that the Obama administration scrubbed the law enforcement agency’s “Terrorist Screening Database” in order to protect what it considered the civil rights of suspected Islamic terrorist groups. The documents appear to confirm charges that Obama administration changes created a massive “hands off” list. Removed data from the terrorist watch list could have helped prevent the San Bernardino terrorist attack. A copy of the [Department of Homeland Security] Office of Inspector General report regarding, concerning, or related to a “hands off list” purportedly maintained by [Department of Homeland Security], US Immigration and Customs Enforcement (ICE), and/or US Customs and Border Protection (CBP) used to allow certain individuals to enter the United States, who had previously been denied entry to the United States or been made to undergo secondary screening by CBP based on suspicion of terrorism ties. Any and all records of communication to or from [Department of Homeland Security] Inspector General Charles Edwards from May 31, 2014 regarding the aforementioned OIG report. On May 6, 2014, Senator Charles Grassley (R-IA) released internal Department of Homeland Security emails revealing an alleged terrorist “hands off” list allowing individuals with potential terrorist ties into the United States. Allegations by former Customs and Border Patrol Officer Philip Haney spurred Senator Grassley’s and other congressional investigations. Senator Grassley previously released emails including a 2012 email chain between Immigration and Customs Enforcement and Customs and Border Protection asking whether to admit an unnamed individual with ties to various terrorist groups. The person was believed to be a member of the Muslim Brotherhood and a close associate and supporter of Hamas, Hezbollah, and the Palestinian Islamic Jihad, according to the email exchange obtained by Grassley’s office. “They came into the National Targeting Center, either physically or through emails and correspondence, and said that we could not develop cases based on association with Tablighi Jamaat [a Muslim religious organization with which the San Bernardino terrorists were reportedly affiliated], and/or any Islamic group,” Haney revealed. Haney said his superiors actually erased some of his files pertinent to the case, because they insisted the initiative had “gone in a different direction” and he was no longer authorized to add his data. WASHINGTON — Tashfeen Malik, who with her husband carried out the massacre in San Bernardino, Calif., passed three background checks by American immigration officials as she moved to the United States from Pakistan. None uncovered what Ms. Malik had made little effort to hide — that she talked openly on social media about her views on violent jihad. She said she supported it. And she said she wanted to be a part of it. American law enforcement officials said they recently discovered those old — and previously unreported — postings as they pieced together the lives of Ms. Malik and her husband, Syed Rizwan Farook, trying to understand how they pulled off the deadliest terrorist attack on American soil since Sept. 11, 2001. Had the authorities found the posts years ago, they might have kept her out of the country. But immigration officials do not routinely review social media as part of their background checks, and there is a debate inside the Department of Homeland Security over whether it is even appropriate to do so. What Investigators Know About the San Bernardino Shooting Officials have discovered a potential link between the attackers and Islamic extremism. The discovery of the old social media posts has exposed a significant — and perhaps inevitable — shortcoming in how foreigners are screened when they enter the United States, particularly as people everywhere disclose more about themselves online. Tens of millions of people are cleared each year to come to this country to work, visit or live. It is impossible to conduct an exhaustive investigation and scour the social media accounts of each of them, law enforcement officials say. In the aftermath of terrorist attacks in San Bernardino and Paris, this screening process has been singled out as a major vulnerability in the nation’s defense against terrorism. Lawmakers from both parties have endorsed making it harder for people to enter the United States if they have recently been in Iraq or Syria. Donald J. Trump, the Republican presidential candidate, has said there should be a temporary ban on Muslims’ entering the country. While President Obama has cautioned against “a betrayal of our values” in the way the United States responds to threats, he has ordered a review of the K-1 visa program, which allows foreigners like Ms. Malik to move to the United States to marry Americans, putting them on a pathway to permanent residence and, ultimately, citizenship. The Obama administration is trying to determine whether those background checks can be expanded without causing major delays in the popular program. In an attempt to ensure they did not miss threats from men and women who entered the country the same way Ms. Malik did, immigration officials are also reviewing all of about 90,000 K-1 visas issued in the past two years and are considering a moratorium on new ones while they determine whether changes should be made. In an era when technology has given intelligence agencies seemingly limitless ability to collect information on people, it may seem surprising that a Facebook or Twitter post could go unnoticed in a background screening. But the screenings are an example of the trade-offs that security officials make as they try to mitigate the threat of terrorism while keeping borders open for business and travel. Ms. Malik faced three extensive national security and criminal background screenings. First, Homeland Security officials checked her name against American law enforcement and national security databases. Then, her visa application went to the State Department, which checked her fingerprints against other databases. Finally, after coming to the United States and formally marrying Mr. Farook here, she applied for her green card and received another round of criminal and security checks. Ms. Malik also had two in-person interviews, federal officials said, the first by a consular officer in Pakistan, and the second by an immigration officer in the United States when she applied for her green card. All those reviews came back clear, and the F.B.I. has said it had no incriminating information about Ms. Malik or Mr. Farook in its databases. The State Department and the Department of Homeland Security have said they followed all policies and procedures. The departments declined to provide any documentation or specifics about the process, saying they cannot discuss the case because of the continuing investigation. Meanwhile, a debate is underway at United States Citizenship and Immigration Services, the agency that approves visas and green cards, over whether officers conducting interviews should be allowed to routinely use material gathered from social media for interviews where they assess whether foreigners are credible or pose any security risk. With that issue unresolved, the agency has not regularly been using social media references, federal officials said. After the terrorist attacks in Paris last month, a furor arose over whether the United States should accept Syrian refugees. Governors in more than two dozen states balked at accepting any. But the vetting for refugees is a separate, longer and more rigorous process than the checks for K-1 and most other immigrant visas. And there is an extra layer of scrutiny for Syrians, who are referred to a national security and fraud office at the Department of Homeland Security for a final look. In that last step, officers can include a social media search, federal officials said. As part of their investigation into the electronic trail of Ms. Malik and Mr. Farook, investigators are searching for devices, including a computer hard drive that appeared to be missing from their home, and cellphones they might have abandoned. On Saturday, a team of divers from the F.B.I. and the San Bernardino County Sheriff’s Department continued their search for those devices in Seccombe Lake in a park about two miles from the site of the Dec. 2 attack. The divers pulled items from the murky waters of the lake, which they have been scouring since Thursday. However, officials would not specify what was found or if it was relevant to the investigation. They cautioned that such searches, particularly one in a bustling public park, tend to dredge up debris from many sources, and that investigators still have to determine the value of what was found. Since its inception in 2002, the Department of Homeland Security has been trying to find the right balance between security and ease of movement — a balance that equates to billions of dollars in trade and tourism each year. “Compared to where we were 15 years ago, we’ve moved the needle very far to the right on security,” Mr. Verdery said. Still, he said, officials have to decide who gets extra scrutiny. Today the government focuses its attention on people in certain fields or from certain countries — foreign scientists, for instance, or young men from the Middle East. As a woman, Ms. Malik likely raised less suspicion, Mr. Verdery said. Investigators are particularly interested in Ms. Malik’s life in Pakistan in the years before she moved to the United States. They believe that was when she was radicalized. From 2007 to 2012, she lived in a university hostel and then with her mother and sister Fehda at a family home in Multan, Pakistan. While there, Ms. Malik studied to be a pharmacist, and she took extra classes at the local branch of a women-only institute that teaches a strict literalist interpretation of the Quran, although it does not advocate violent jihad. In a brief telephone interview on Saturday, the sister, Fehda Malik, said Tashfeen Malik was not an extremist, and she rejected the allegations against her sister. She said her sister was religious, studied the Quran and prayed five times a day. “She knew what was right and what was wrong,” Fehda Malik said. She added that the family was “very worried and tense,” before hanging up the phone. On social media, Fehda Malik has made provocative comments of her own. In 2011, on the 10th anniversary of the Sept. 11 attacks, she posted a remark on Facebook beside a photo of a plane crashing into the World Trade Center that could be interpreted as anti-American. Social media comments, by themselves, however, are not always definitive evidence. In Pakistan — as in the United States — there is no shortage of crass and inflammatory language. And it is often difficult to distinguish Islamist sentiments and those driven by political hostility toward the United States. At the time Fehda Malik’s comment was posted, anti-American sentiment in Pakistan was particularly high; four months earlier, American commandos had secretly entered Pakistan and killed Osama bin Laden. Matt Apuzzo and Michael S. Schmidt reported from Washington, and Julia Preston from New York. Declan Walsh contributed reporting from Cairo, Salman Masood from Islamabad, Pakistan, and Rick Rojas from San Bernardino, Calif. The Boston Globe article is important because it deals with nothing less than the security of our nation and the safety of our citizens. This is literally a news report about life and death. In the wake of the terrorist attacks of September 11, 2001 the administration which had just taken office began to implement the biggest re-organization of the federal government in many decades. The creation of the Department of Homeland Security was supposed to protect our nation from the continuing threat of future terrorist attacks. It certainly provided the illusion that the administration was determined to secure the homeland. Some of the measures that were implemented were useful. However, as those of you who have read my commentaries, read my Congressional testimony or heard me speak on television and radio programs and at conferences I have attended around the United States know that I am extremely dissatisfied with the progress (or lack thereof) in truly protecting our nation and our citizens. I have been so angered and frustrated that I have, on occasion suggested that the DHS should be renamed the Department of Homeland Surrender! How in blazes can the administration and our nation's "leaders" honestly speak about "Homeland Security" when there are millions of foreign citizens in our country in violation of law? We have no reliable way of knowing the identities of these millions of illegal aliens. We don't even know, with certainty, what their nationalities are. We don't know about their possible criminal histories or affiliations with criminal or terrorist organizations. We don't know what their intentions are and there are so many of these illegal aliens in our country that if we were to somehow gather them into one place and drew a chalk line around them, they would constitute the 2nd or 3rd most populace state in our country! Even legal immigration is so mishandled that the fraud rate stands at some 90% in some areas where aliens are granted lawful immigrant status! Report after report issued by the Office of the Inspectors General of several agencies and the GAO (General Accountability Office) paint a horrifying picture of nonfeasance, misfeasance and malfeasance by USCIS (United States Citizenship and Immigration Services). Incredibly, when DHS was created a wall was erected between the components of the immigration administration and enforcement program. As bad as the former INS was, the creation of two distinct agencies, ICE (Immigration and Customs Enforcement) included the interior enforcement elements of the old INS. This includes the special agents of the INS and the officers of the Deportation and Removal Branch, the administrative equivalent of the probation department. Additionally, ICE also folded in special agents of Secret Service and the U.S. Customs Service. It also included the GSA police that are charged with protecting federal buildings. Finally, TSA employees were also folded into this unwieldy bureaucracy. CBP (Customs and Border Protection) included the U.S. Border Patrol, another former component of the INS along with from Legacy INS, Legacy Customs and the U.S. Agriculture Department. Finally, as I noted above, USCIS (United States Citizenship and Immigration Services) became a "stand alone" agency that adjudicates all of the various applications filed by aliens seeking everything from a change in immigration status and extensions on their authorized period of admission to the acquisition of lawful immigrant status and even United States citizenship. Many of the managers at ICE and CBP came from Legacy Customs. They have little or no background in the enforcement of the immigration laws and just as little interest in enforcing those critical laws. I have heard from some of the disgusted employees at those agencies that their bosses are more concerned with counterfeit designer luggage and jeans than they are about counterfeit passports! The first director of USCIS was a guy by the name of Eduardo Aguirre. You would have imagined that the director of an agency that had such serious national security implications would bring a wealth of experience in law enforcement with him to this important component of Homeland Security. In point of fact, he had previously been the director of the private bank of the Bank of America. Yes, that Bank of America- the bank that encouraged illegal aliens to apply for credit cards and accepted Mexican Matricula Consular cards and ITIN's instead of SSN's. His successor, Emilio T. Gonzalez had an impressive military background, but the job he had immediately before being assigned to USCIS was to work for a law firm that specialized on lobbying activities, Tew Cardenas. I testified at several hearings before various committees on the topic of the merger of those dissimilar agencies. To succinctly sum up what I had to say, the merger of Legacy Customs and Legacy INS plus several other agencies constituted a "shotgun" wedding that I predicted would never be consummated! "NEW ''DUAL MISSIONS'' OF THE IMMIGRATION ENFORCEMENT AGENCIES"
You can read the transcript of that hearing by clicking here. Add to all of this the fact that the potentially deadly Visa Waiver Program is being expanded when, in fact, it should have been terminated on September 12, 2001. What is astounding about all of the discussions about the "War on Terror" is that there is absolutely no mention of the role of immigration law enforcement in conjunction with efforts aimed at preventing terrorists who want to enter our country and embed themselves within our country to enable them to attack our nation! While Secretary of Homeland Security Michael Chertoff boasts about how the administration has doubled the number of Border Patrol agents so that there are now purportedly more than 18,000 such agents, there is absolutely no mention made of how many special agents are at ICE. In fact, I have been told that the number of ICE special agents is considered national security information! Supposedly the rationale is that they don't want the terrorists to know how many agents are "out there." I believe that they don't want the American citizens to know how few agents are enforcing the laws for our nation. I believe that there are about 6,000 special agents at ICE and somewhere between 3,000 and 4,000 ICE special agents are dedicated to enforcing the immigration laws for the entire country. This is an outrage! New York is the safest big city in the United States. With more than 8 million residents, the city of New York has more than 36,000 police officers. It was recently announced that an additional one thousand cops were to have been hired but won't be because of the downturn in the economy. Immediately concerns were raised about the potential that this loss of one thousand additional cops would have on crime rates! Meanwhile, there are somewhere between two and three times as many illegal aliens scattered across the entire country as there are residents living in the city of New York. Yet the number of ICE agents is just about 10% the number of police officers who protect New York City! It must also be noted that ICE special agents are supposed to conduct many investigative and enforcement missions in addition to seeking to arrest illegal aliens. They are supposed to enforce sanctions against employers who knowingly hire illegal aliens. They are supposed to work cooperatively with other agencies in narcotics, organized crime and terrorism investigations. These agents are supposed to conduct investigations into fraud document vendors and those who concoct fraud schemes to circumvent the immigration laws. They are supposed to conduct investigations into alien smuggling. When was the last time you heard anyone in a leadership position even talk about thee critically important missions? The news article below, did not even talk about the enforcement of the immigration laws from within the interior of the United States! I regularly speak at a seminar conducted in Washington, D.C. involving employees of various intelligence agencies and the military. Not long ago, while doing my presentation a young lady at the rear of the room seemed to be upset with my discussion about illegal immigration. I stopped speaking and turned to her and asked her what was bothering her. She told me that many members of her family had been immigrants and that she was uncomfortable with what I had to say about the risks of having millions of illegal aliens in our country. I told her that my mother was also an immigrant, but the difference between an immigrant and an illegal alien was equivalent to the difference between a houseguest and a burglar. I decided that an analogy might help her to understand my perspective so I asked her what she would do if that evening she decided to grab a midnight snack before going to sleep. To flesh out the scenario I asked her how would she react if she went downstairs to the kitchen from her bedroom and in passing the living room on her way to the kitchen, if she saw a half dozen people milling about in her living room she did not recognize, what would she do? I asked her, "Would you simply pour yourself a glass of milk, grab some cookies and head to your bedroom?" On the other hand, I asked her if she thought it would make more sense to call the police. Without hesitation, as you might expect, she said she would call the police. I responded by telling her that the United States has the equivalent of millions of strangers milling about our country in communities from coast to coast and border to border. I asked her, "How safe could that possibly make you feel?" After my presentation was completed she came over to me and told me that the analogy I provided her with helped her to gain a new perspective. I hope that this works for you as well. We the People must make our voices heard! Right now the administration and members of Congress are moving forward with their plans to create an amnesty program for millions of illegal aliens currently living in our country in violation of law and we know absolutely nothing about them. The open border advocates are providing hefty campaign contributions for the politicians and making their voices heard. They are determined to foist Comprehensive Immigration Reform (CIR) on this country and our citizens. If they succeed, there will be no way to undo the damage or reverse the process. Ms Burriesci - Homeland Security in front of Congress..
Why isn't this front page news? Why? Why? and Why? This is absolutely disgusting. Where are these numbers and why don't we as a nation know them. WTF? During an excruciating exchange before the House Government Reform and Oversight Committee, Rep. Trey Gowdy (R-SC), grilled Department of Homeland Security official Kelli Ann Burriesci over the Constitutional rights of American citizens. At issue for Gowdy was the lack of due process afforded to citizens before they are placed on the government’s secret terrorist watch list. Yeah, this one was over at the coin toss. 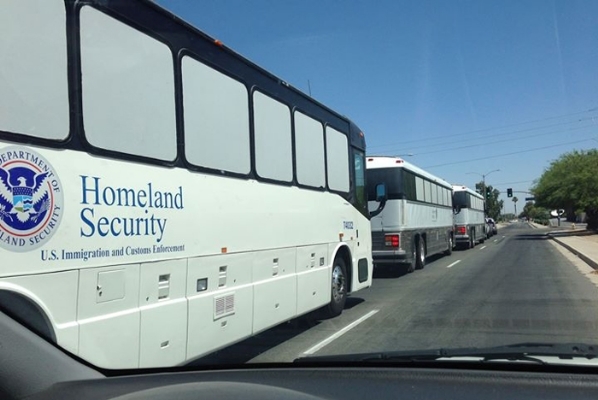 DHS buses carry immigrants from the border to detention centers where they are processed, given a court date and released. They are coming from Somalia and other African nations, according to a Homeland Security official who was caught recently transporting a busload of Africans to a detention center near Victorville, California. Somalia is the home base of al-Shabab, a designated foreign terrorist organization that slaughtered 147 Christians at a university in Kenya just last month. It executed another 67 at the Westgate Mall in Nairobi, Kenya, in 2013, and has put out warnings that it will target malls in Canada and the U.S. Dozens of Somali refugees in the U.S. have been arrested, charged and convicted of providing support to overseas terrorist organizations over the past few years. Libya is also awash in Islamist terror following the death of Moammar Gadhafi in 2011. ISIS beheaded 21 Coptic Christians on a Libyan beach in February. So when Anita Fuentes of OpenYourEyesPeople.com posted a video of a U.S. Department of Homeland Security bus pulling into a Shell station in Victorville, on the night of May 7, admitting he had a busload of Somalis and other Africans who had crossed the southern border, it raised more than a few eyebrows among those concerned with illegal immigration and national security. A man who appeared to be a Customs and Border Patrol agent was filmed at the gas station at 10:30 p.m. When questioned by Fuentes, he informed her that his large touring bus was full of Somalis and other Africans being transported to a nearby detention center. The tour bus had the U.S. Homeland Security logo, and the agent appeared calm and professional. Watch video clip of border officials admitting they are bringing in Somalis and other Africans from the southern border. “A detention center over here?” Fuentes asks. Victorville is about 161 miles from the Mexican border. “Is that because they’re crossing the border?” Fuentes asked. “Well they’re coming in asking for asylum,” he said. “That’s what it is, that special key word huh? That’s a password now?” Fuentes said. “That’s what the password is now,” he responds. The flow of information stopped when Fuentes asked about the presence of ISIS near the border, a story which the watchdog agency Judicial Watch reported last month. “ISIS being at the border?” she asks. More than 100,000 Somalis have been brought to the United States legally since 1991 through the U.N. refugee resettlement program. Close to half of them have been resettled in Minnesota, with the rest dispersed throughout Ohio, Maine, California, Texas, Idaho, Tennessee, Colorado, Georgia and several other states. The Somali community in Minnesota has had well-documented problems assimilating, running up a troubling record of crime and radicalization. Scores of Somalis have been arrested and charged with providing material support to overseas terrorist organizations such as al-Shabab, al-Qaida and ISIS. At least two Somalis in Columbus, Ohio, have also been arrested on terrorism charges. While most of the Somalis have been brought into the U.S. by the U.S. State Department in cooperation with the United Nations, exactly how many Somalis may be entering the country illegally and applying for asylum is difficult to ascertain. According to official DHS data, 688 Somalis entered the U.S. as asylum seekers between 2004 and 2013. Asylum seekers from other African countries with radical Muslim populations are also showing up at the border. According to DHS data, 139 Libyans crossed into the U.S. between 2011 and 2013, while only 20 had made the risky trek between 2004 and 2010 when dictator Moammar Gadhafi was in power. The number of Eritreans and Ethiopians showing up at the U.S. border and seeking asylum is also growing: 1,495 came from Eritrea between 2004 and 2013, and 5,863 came from Ethiopia. A Customs and Border Patrol agent, who asked not to be identified, told WND that many more Africans and Middle Easterners are likely crossing over the Mexican border than what DHS is willing to admit. That’s why the video is raising eyebrows, because the agent appears unfazed, as though transferring busloads of Somalis and Africans to detention facilities is a routine task. Once at the detention facility, asylum seekers are often asked to fill out legal documents, given a court date and set free. Asylum seekers are required to show they belong to a group of individuals who are suffering from a “pattern and practice” of persecution, either from their native country’s government or from non-government entities that the government is unable or unwilling to control. The Obama administration has decided to spend $2 million to hire attorneys for alien minors seeking asylum in the U.S. this year, Judicial Watch reported. After filming the busload of African asylum seekers in Victorville, Fuentes posted on her YouTube account that they were being taken to a detention center in the high desert, thumb printed, and let go. “My friends, many Somalians are Muslim and many Africans especially in the northern region of Africa are radical Islam terrorists. Lord have mercy,” wrote Fuentes, whose husband, Ignacio, is a pastor. William Gheen, president of the Americans for Legal Immigration, or ALIPAC, said the word “asylum” has indeed become the password for foreign nationals showing up at the border. They will be taken to a detention center to be processed and given a court date along with contact information for an asylum attorney and a religious charity that will help them find housing, food and clothing. “And they will even be given instructions on how to get their Obamaphone,” he said. “And that video is further clear evidence that Obama and his administration is involved in a conspiracy to overthrow America’s defenses, laws, borders and republic by flooding America with as many people as possible who will be dependent on the system and the socialists who helped them,” Gheen told WND. “He’s going for broke because he knows that (Mitch) McConnell, (John) Boehner and the other sell-out Republicans won’t stop him. After announcing his plans on Nov. 20 to unilaterally grant amnesty to more than 5 million illegals, Obama created the White House Task Force on New Americans. The task force released its long-awaited report last month. It contained 70 pages of goals, guidelines and strategies that involved using 16 federal agencies, including DHS, to build “welcoming” communities across the U.S. that would work to “integrate” the record numbers of new immigrants and refugees. “That’s more than any other nation on earth,” Gheen said.